I'll be all over the net for the next couple of days, at least it seems that way from the number of interviews I've given. Wizard, IGN, Comic Book Resources, QuickStop and of course another party with the geeks at COMIC BOOK GEEK SPEAK Episode 220. Hey, Deemer! Read the freakin' Hellboy TPBs! Mike Mignola will also be on UGO and G4 Tech TV. Granted, most of my DVDs were released before the Internet became so user friendly - although I used to be a participant in the Rescue Rangers list by Stephanie da Silva before the net had pictures. But I've never promoted a project like I have this one. If you've been paying attention, you'll know its because the chance to do future Hellboys depends on the sale of these first two. That means a lot to me. I don't get a bonus if this sells over a certain amount... although that isn't a half bad idea. Hmmn, haven't signed a contract yet. I need to give my agent a call. Where was I? Oh yeah, why more are important to me. Its not employment, I've already fielded offers on a couple of amazing projects. It's because I love working in the world of Hellboy and we're not done yet. We'll know if the DVD is a success by the end of the week but that doesn't mean a green light. I assume we'll have a decision by the time Mike and I appear at the New York Comic Con with a special preview of Hellboy: Blood and Iron. But I'm already writing number three and I'm about 15 minutes into it and I think you guys are going to go crazy. In a good way. Once it's announced, I'll start blogging about it. I try to follow the creative process even more closely than I did the first time around from idea to treatment and script to music and mix. We know what we're getting into this time so I'm better prepared to give you a good perspective on it. Wish I could be there, Tad. I am sure there will be a rousing crowd of supporters all with a SoS DVD clenched in hand. Already pre-purchased mine. Got my friend to preorder one. And I'll keep hyping it from there. I specifically bought a region one dvd player so that I could buy and watch the animated Hellboy DVD's. Eagerly anticipating the release. Hey Tad I'm gonna try and catch Mike at dvd planet (1 dvd purchase)and my son wants the bust-ups from the bestbuy copy(2 dvd purchased) and dark del (3dvd)thanks goodness I got gift cards for x-mas!!! Not much information, but the picture looks promising. Tad you are doing a fantastic job, and I love reading this blog. Keep up the good work. thanks jeremy....yeah well i picked up my helboy animated today without the figurines unfortunately. I have to say. Tad you have done an excellent job. The DVD is chalk full of stuff. After seeing the behind the scenes stuff, I have a whole lot of new respect for everyone involved in the creation of the film. I particularly ( being an artist myslef ) really found Cheeks character designs, and all the flashes of storyboards or background layouts/paintings + model sheets and props extremely interesting. I have been wondering if at some point, maybe if a third film is made possible...A production/art of Hellboy animated might be released. Taking HB Mike Mignola comics and converting it is never an easy thing. A collection of artworks from the production would be great. Just got my copy, and watched it. What's up with the fox that occasionally appears on screen? I assume it represents some kind of special feature, but what, and how do I access it? There should be an option that let's you turn it off. If you click on the fox it will take you to some of the extra features. Those extras are also available on the menu under "Hellboy Goes East." Great to hear that you're pushing this really hard and I'd love for there to be a 3rd Hellboy animated movie. I wish I could be there for the NYCC since I was at SDCC and was in the audience for the Sword of Storms panel. "This may not seem like a big deal, but for those of us who depend on Closed-Captioning (CC) to watch movies, this IS an important issue. 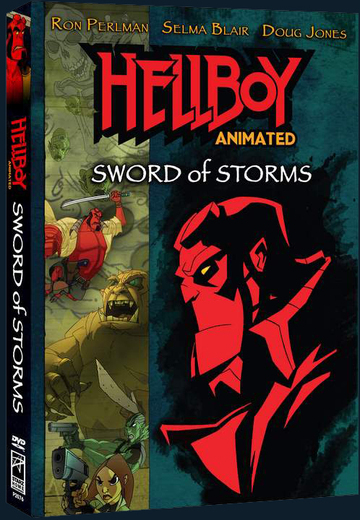 Today I rented "Hellboy Swords of Storm" because I wanted to see it and also because the back of the DVD box clearly shows the CC logo - indicating that this movie is Closed Captioned. Well, it isn't. To have the CC logo on this movie is completely misleading as well as fraudulent. How could Starz Home Entertainment get away with this? Obviously the company simply could not care less when it comes to customers who are hearing impaired. I'm only thankful that I didn't BUY this video. Thanks for letting me get this off my chest." I thought you'd like to know if there is a problem. several set top players here. CC functioned properly in every case. I watched it on my Mac. There is no CC option in the menu but I turned it on in the player controls. I got mine! I think that the Mignola interview is one of the best I've ever seen. Hi there. I heard that one of the reasons that this film was animated in a non-Mignola style was because it infringed some kind of copyright agreement. This confused me, since I didn't think that anyone could legally own a particular style of drawing. Is there any truth to this? Thanks! Look back to the first month of archives of this blog; it's covered in lots of detail. I encourage everyone to start at the beginning. The blog was much more interesting then. I'm just treading water now. But in a nutshell: it was part of the deal that the show NOT look like the comic Hellboy. I assume it's because of merchandising. If you put out a poster of the animated Hellboy and it looks exactly like the comic Hellboy, who has the rights? More than that, Mike wanted a different look to the movies. Awaiting the results with fingers crossed. Bought my two copies and got my friend to pick one up. So I know it has sold at least THREE! copies. Is that enough for a greenlight on the third movie? Ok...got carried away there. But I am anxious to hear how the first week went. And I hope the signing went well today. I know there is a copy winging its way to me soon! I bought the DVD after work on Tuesday and watched it immediately with a pal (since I was unable to watch it on Cartoon Network). I work at a certain large bookstore that sells DVD's, and the movie has sold fairly well this week. Here's hoping you get to keep making them! Byron Dunbar...Have you checked out the Amazing Screw on Head pilot episode? It was released on DVD. And it is a rare gem considering it is probably the closest your going to get to seeing his style animated. Mike emphasized many times that he just felt plain uncomfortable having another medium reflect his style so closely, because he's really the only one that can do it. And its true, as cool as the screwonhead cartoon may look, there are some parts that are definetely not Mike Mignola. BTW Tad...I guess its a no-go on the model sheets? I wasn't going to get my hopes to high anyways.